Roast pork with dumplings and cabbage (vepřová pečeně s knedlíky a se zelím, colloquially vepřo-knedlo-zelo) is considered the most popular Czech dish. Left: Vepřo-knedlo-zelo (Roast pork with dumplings and cabbage). There are two variants of preparing the cabbage, Bohemian and Moravian. 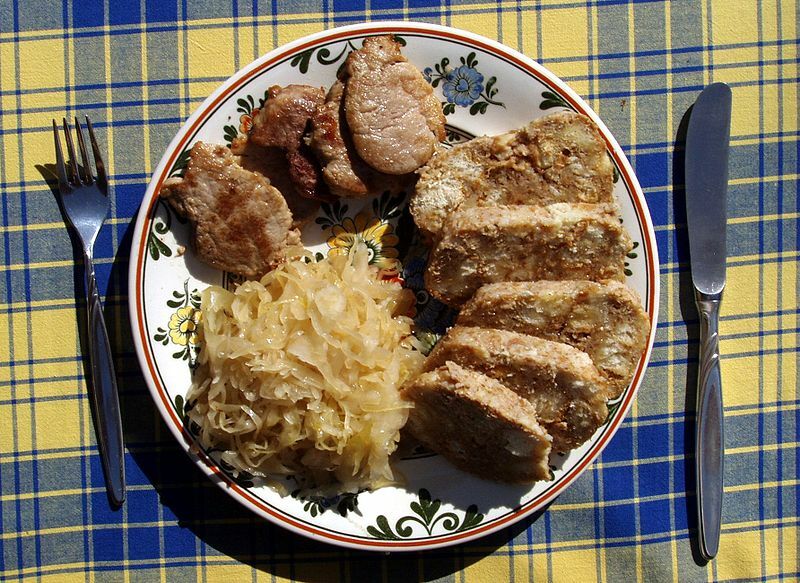 Bohemians prefer the cabbage to be sour, so they prepare the dish from sauerkraut. In Moravia it is preferred sweeter and so is prepared from fresh cabbage, or by adding some sugar, if the fresh variety is not available. But these variants aren't strict, and either may be available in each region.